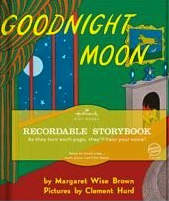 Hallmark Recordable Storybooks Are A Bedtime Story Win! You are here: Home / Resources / Hallmark Recordable Storybooks Are A Bedtime Story Win! One of the best parts of our day is getting to read and pray with Noah right before tucking him in for a good night’s sleep. We have collected a nice library of children’s books since Noah was born, including this really cool Goodnight Moon Hallmark Recordable Book you see in today’s video. What makes this book so special is that Noah’s grandmother and two of his uncles are actually reading the story to him. Fun, huh? The Hallmark Recordable Storybook Is A Win In Any Child’s Library! Noah's a fan of his Goodnight Moon recordable storybook! This book would be an awesome gift to give to your child when you can’t be with them…like when you’re at work, or on a date night with your significant other! Or if your child’s grandparents are anything like Noah’s their always asking you for gift ideas to spoil your little one rotten with (which is ok…..that’s what Grandma’s do!) If that’s the case feel free to forward this post on to them; I think one of these Recordable books makes a great grandparents to grandchild present. This actually makes a great grandparent gift for Noah because neither of his grandmothers live near him, so these books make a great way for Noah to stay connected to his grandparents. And if you’re looking for another fun and creative book idea be sure to check out this video of Noah being introduced to The Tickle Monster; it’s another can’t miss book! Recordable books are a good runner up to FaceTime! I love watching my wife be a mommy. Seriously. It’s awesome! There are no words to describe how great of a mom, wife, doctor, etc…this women is. There’s no one I would rather journey through life with then my wife. She’s simply great. I can honestly say I have never met another person that works as hard (and with such excellence) as she does. I think God designed her with super powers because she never stops. I love these two so much! 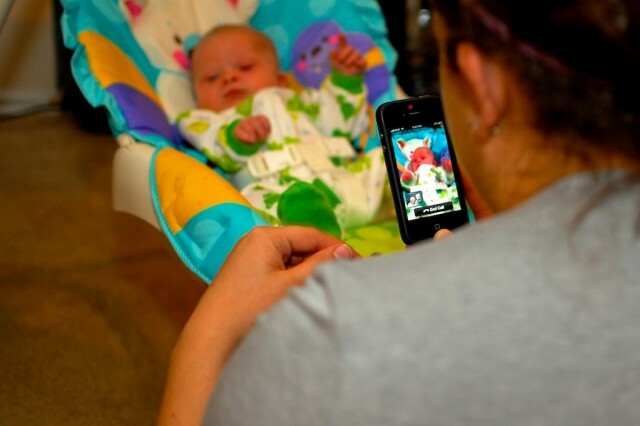 I know there are many views on the topic of working mothers, gender roles, etc….and that’s ok. However I’ll say this, I’ve watched my wife for the last three and a half years go through residency (grueling), manage our house (seriously, she’s an incredible chief! ), support and love her husband (that’s me), and shatter every expectation of what I imagined a good mother would be (to sweet little Noah) — all at the same time! Wow..! Some people look at our family, and feel sorry for us. I know they do. 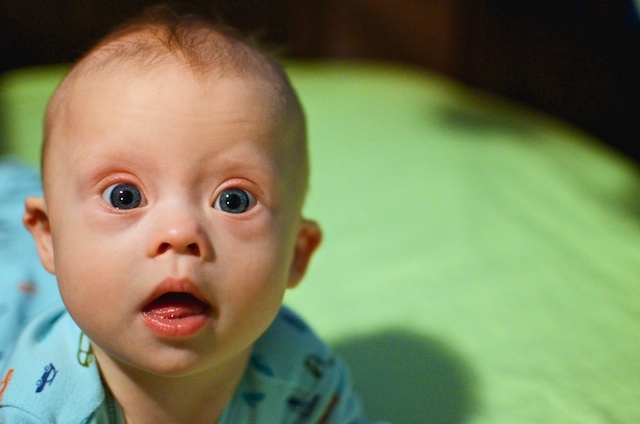 I can sense the “sorry-ness” in their voice when they find out our son was born with Down Syndrome. I hope one thing is clear as you browse this website and see our daily videos and pictures – (and the headline of this interview) there is no reason to feel sorry for us. Seriously. I mean it. For real. Pinky swear. Cross my heart, and hope to…..you get it…? Our life has never been better. Ever. We are in a great place. Our family is having a blast. God is way, way, way, way to good to us! 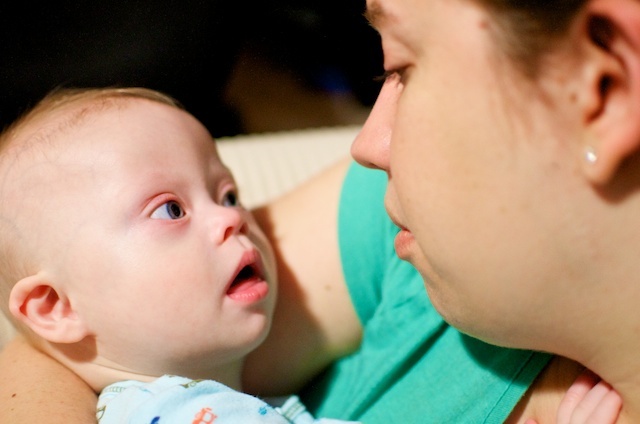 Our friend’s who are also raising a child born with Down syndrome have nicknamed their house “The Fun House” so I don’t want to infringe on their trademark, but I hope it’s clear that our house is full of love…..and fun….and God. Have you ever tried out on of the Hallmark Recordable books? What other fun books / grandparent gift ideas do you? We really enjoying hearing what you have to say, and enjoy reading all the fun ideas you share with us. Keep them coming! Love the expression on Noah’s face when they said Goodnight Noah! He was like wow they know my name! too cute thanks for sharing! Have you heard of Story Before Bed? It’s a way to record lots of books. Requires a subscription, but sometimes they offer a book for free. I have a few on my iPad (without getting a subscription.) The cool part about it is that you can also include video. I video myself reading the book, and the boys are in the video with me. A good reminder of what they were like at that age, and–for Caleb–what kinds of questions he asked. You can be sure that the Emperor’s New Clothes video is priceless! My kids have a recordable storybook that the Grandparents did. Our parents do not live close so it is great that they can hear their grandparents voice anytime they want. Sarah loves to go read with Nana and Pop-pop. That’s awesome! We wish Noah’s grandparents live closer. Which recordable storybook do your children have? We have Thank You, God, for Everything; Twas the Night Before Christmas; and My Little Princess. My mom did the Thank You God for Elijah, the princess one for Sarah. She has not done one for Isaac, need to get her to do one for him. My dad did the Christmas one for all of them. Sarah really loves them. My mom got her a book that has a bookworm that reads for her, she really loves the interactiveness. She can sit forever looking through books. She likes us to read to her. There are also several Hallmark apps (free) for the iPad that are books you can record. No video. Works a lot like the “real” books, I think. Search “Hallmark Cooper” to get one story, and the other Hallmark stories should be listed somewhere on that page. You encourage and uplift me so much. Our journey is very similar . Our fourth child has Mosaic DS and it’s been nothing but pure joy. I know people feel sorry for us but it’s unesscessary. Of course we’ve had moments of worry for Max but God is good ALL the time! Cool story book. Your wise sounds like an awesome person it’s great that you appreciate her 🙂 I can relate to what you said about the sorry-ness in people’s voice when you tell them Noah has Down Syndrome I hear that when I tell people I have Cerebral Palsy. Thanks so much for your kind words. Do you have any children? Well…3 in Heaven. 🙂 Would love to adopt, but that would take a real live miracle. Blessings to you!